Today was a very big day for developers around the world. Microsoft announced a ton of exciting news at the Connect event in New York with keynotes from Scott Guthrie, Soma Somasegar, Scott Hanselman and Brian Harry. Read more details in the Microsoft News Center: Microsoft takes .NET open source and cross-platform, adds new development capabilities with Visual Studio 2015, .NET 2015 and Visual Studio Online. On MSDN, you can now also download Team Foundation Server and Visual Studio Release Management 2013 Update 4 which offers the capability to connect Visual Studio Release Management to Visual Studio Online. 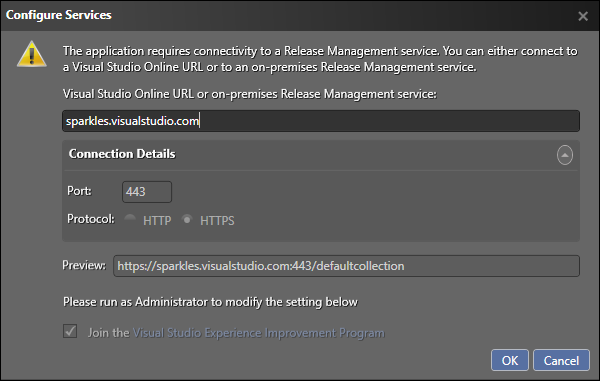 Before it was only possible to connect Visual Studio Release Management to an on-premises Team Foundation Server. I wrote a small guide to get you started with Visual Studio Release Management for Visual Studio Online and how to create an Azure Release Management environment via the (old) Azure Management Portal. Download and Install the latest bits of the Release Management Client. Hit OK and after logging in with your account credentials to VSO, the RM client should be connected to “TFS in the cloud”. 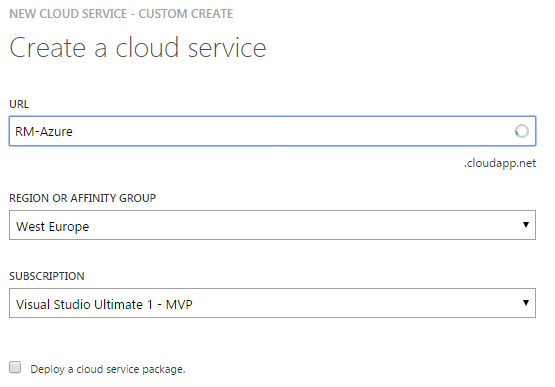 Create a new Cloud Service via the Azure Portal to group all Release Management VMs. 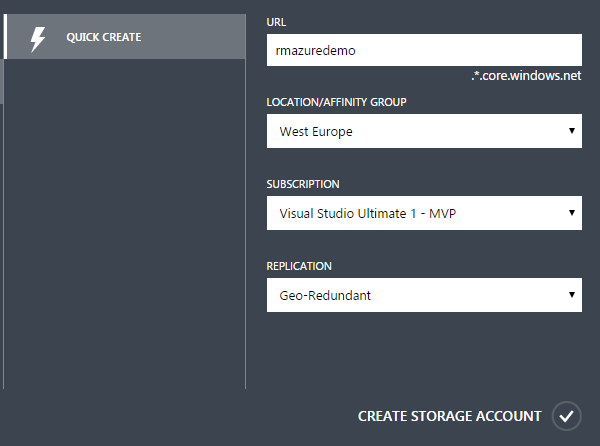 Create a new Storage Account via the Azure Portal to group all Release Management VM storage. Note that I have created my storage account in West Europe. Be consistent and reuse your region of choice when creating the VM(s) later. Find out more about all Azure Regions. 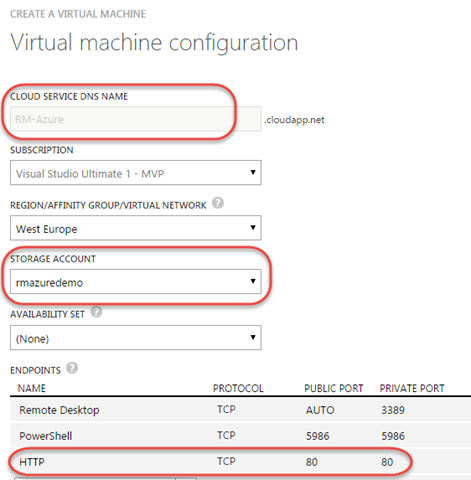 Create new (Gallery) VM(s) via the Azure Portal in the newly created Storage Account. Download the Azure Publish Settings file to get the Management Certificate Key.To be able to complete the next step, you will need the Management Certificate key to connect from the Release Management client to your Azure subscription. 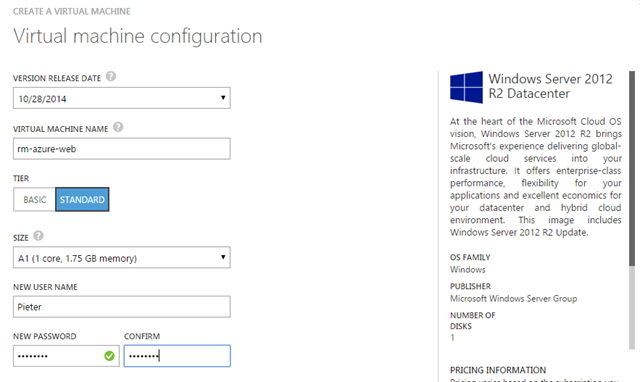 There are a number of ways to get the key, but the easiest way in my opinion is to navigate to https://manage.windowsazure.com/publishsettings, log in with your Azure credentials and save the publishsettings file. Open the file with notepad and copy the full ManagementCertificate value (without quotes) in your subscription. 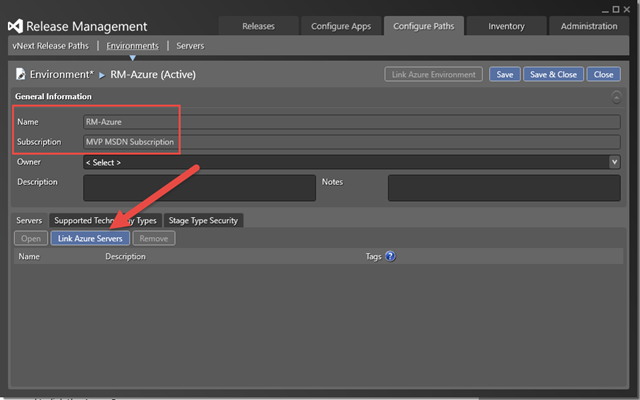 Configure the Release Management Client to add your Microsoft Azure subscription.Navigate to the Manage Azure section in the Release Management Client and add a new Azure Subscription. Make sure to enter the Storage Account Name you have created in one of the previous steps. Create a new Release Management Environment, linked to the Azure subscription. 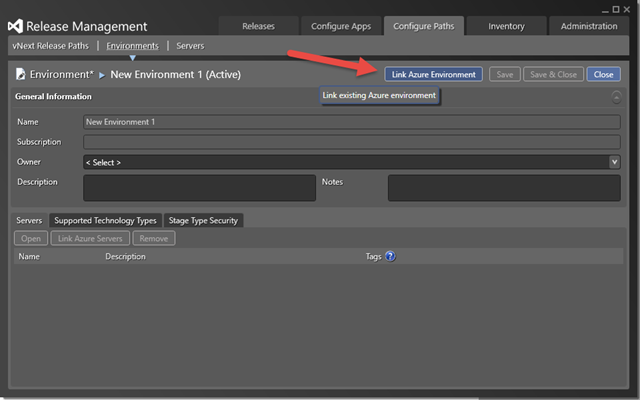 Navigate to the Configure Paths tab and select the Environments link to click for a new vNext Azure environment. Now, before you can add your VMs to an environment you must link the environment to an Azure environment via the top right button “Link Azure Environment”. 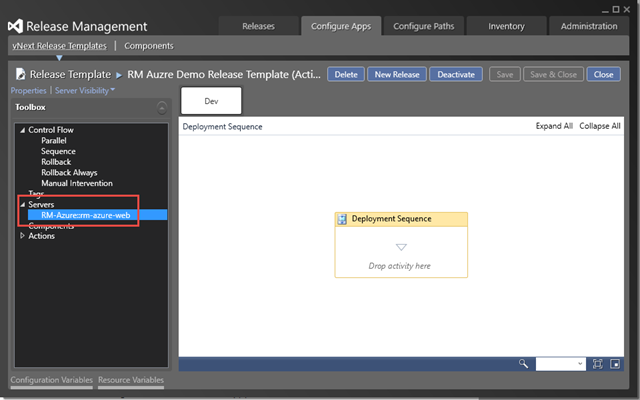 Select the Azure VM Cloud Service endpoint you want to include in the new Release Management (RM) environment and finish off by hitting the Link button. This linking will enable you to select Azure VM machines in the RM environment. Also note that the Environment name and the MSDN Subscription have been populated (read-only), but you still need to link the Azure Servers. With one or more Release Management environments setup, you can start defining a Release Path and once that has been setup, it will be possible to create a new (vNext) Release Template to define your deployment actions. All the appropriate Azure VMs will show up in the Release Template toolbox. Enjoy connecting RM to VSO! No excuses anymore to not setup your release pipeline!